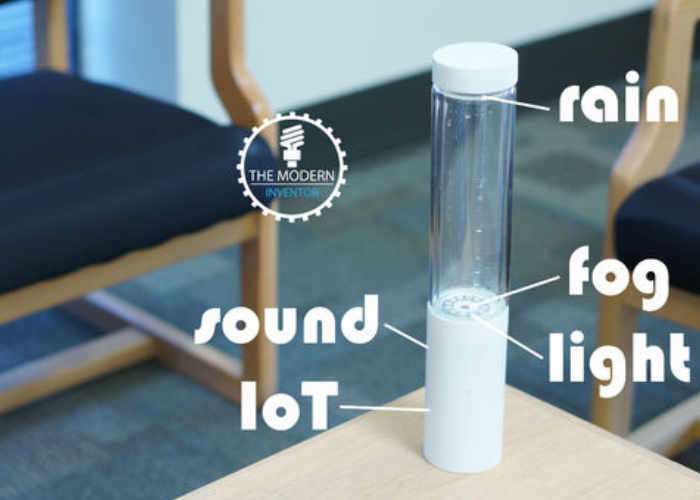 Powered by a Raspberry Pi Zero W a unique desktop weather simulator has been created called the Modern Inventor’s Storm Glass. Which provides a weather-simulating lamp that can recreate the weather of any location in the world, all thanks to the help of a Raspberry Pi mini PC and the Weather Underground API. The API enables the Raspberry Pi to access current and predicted weather condition around the world. The base of the jar is fitted with the Pi, together with a speaker, microphone, Speaker Bonnet and NeoPixel Ring from Adafruit. Now you can take a little piece of the outdoors and place it on your nightstand. The Storm Glass actually recreates the weather conditions outside to give you a weather forecast for the day. It does this by checking the weather periodically online, and if it’s a rainy day you can expect to see some rain falling in the Storm Glass Lamp. If it’s partly cloudy you should see some clouds forming and some sunshine interspersed here and there. This project was inspired by the open tempescope, but it was adapted for off-the-shelf parts. An added bonus is that it costs much less too. For more information and to build your very own jump over to the Instructables website via the link below.